My sheep are gone. My livestock guardian dogs are gone. I’ve had Barbados Blackbelly sheep for 17 years and the dogs for 7. I don’t know the version of me who doesn’t have sheep and dogs. I made the decision to sell my flock and dogs last January. I’ve spent the last 6 months trying to get my head around the idea and to live with my decision. I found them the best homes I could. The dogs get to stay with their sheep. They will be well cared for and loved–both the dogs and the sheep. It is so quiet tonight without the dogs barking at owls and rabbits. Ever since they came to live here, I’ve always felt safe knowing they were out there, protecting the sheep and my farm. Sometimes they barked at things that I might have wished they wouldn’t, but I remember too well the horror I went through before they came, when a cougar and coyotes got into the back ram pasture and devoured four entire 90-lb ram lambs in one night’s work. The cougar came back 2 weeks later and started on the ewe lambs, killing one before I could get out there with my gun. I locked the sheep behind bars at night for the next 2 months until my friends could bring the two Pyranees/Anatolian puppies they sold me. I’ve slept well every night since they arrived in 2004. The barns are empty. There are no happy bodies in my pasture. This will take some getting used to. Why is this important? I had to do something that I knew was going to be incredibly painful because I also knew it would be the right thing to do for the sheep. Health issues were making it difficult to care for them. The rams had learned that they are bigger than I am, which is not something you ever want a ram to learn. Three weeks ago, a ram joggled my knee on his way past me and buggered it up. It was just beginning to feel better last week so I decided to spend the day grooming my ewes so that they would look beautiful for the big sheep transport day. Long story short, a crazed yearling jumped into my face and caused me to put all my weight on my bad knee. Now it is seriously buggered up. So although I had planned to sell the sheep before I got hurt, it didn’t turn out that way. But the injury was very convincing as to the wisdom of my decision to sell. This entry was posted in Sheep on June 14, 2015 by eweforia. I’m single and I raise sheep. Not just any sheep, but flighty, unpredictable sheep that are impossible to manage single-handed. The sheep are Barbados Blackbelly, but they are not the subject of this post. Not long after I got my flock started, I realized I needed another hand. So I traded a few sheep and about a thousand dollars and got a “started” herding dog. “Started” means that he has learned basic herding commands, knows how to handle the sheep better than I do, and will stop and lie down when I tell him to. That’s all I needed—an employee. That was many years ago and old Gage, my Border Collie, is arthritic and lame. He has a heart murmur and doesn’t seem to be doing well. Asking him to work sheep could get him hurt. I realized last month that I needed to start looking for another dog if I wanted to continue raising sheep. Several years ago, I was given a retired Border Collie, a grand champion who, at 11, just needed a quiet farm life away from dog trials. He had reached 15 when I had to put him down. So my first thought was to locate his original owner and let her know that I was looking for another retired dog. I found her in Arizona and amazingly, she just that week decided to rehome Teal, a 6-year-old, fully trained Border Collie whose hips wouldn’t certify and thus couldn’t be sold. A week later, he had hitched a ride with a gal driving from Phoenix to Wyoming via Pueblo (my town). VOILA! I have a new used dog. Teal has settled in well and enjoys his new farm freedom. No more living in kennels and only being off-leash when training. He now enjoys chasing birds and squirrels, tormenting cats, and running—constantly running—for the sheer joy of it. Oh, and he occasionally gets to herd sheep. Why Is This Important? There could be a whole new, better life just waiting around the corner if you don’t give up when the first one doesn’t work out. This entry was posted in Sheep and tagged border collie on February 2, 2013 by eweforia. Today I l earned yet another valuable lesson about my sheep: When you wean a ram lamb by removing him from the ewe flock, don’t put him back into the ewe flock. A buyer is coming tomorrow morning to pick up two ewes and a weanling ram lamb (13 weeks old). I need to have the lamb and ewes all in one area for loading. Because I’d rather not try to move the ram flock into the sorting pen in the dark and cold tomorrow morning (and perhaps even a blizzard), I decided to move the weanling ram today while it was light and warm. He could overnight with the ewes and say hi to his mom (he was weaned two weeks ago). It was a good plan. As soon as I put him in the ewes’ pen, I knew I’d made a serious mistake. The ewes seriously wanted to injure him. Even his mother joined in the attack. I’ve never seen them deliberately chase and run down another sheep before, but these girls had murder in mind. And they wouldn’t stop. They ran that poor little guy around and around, butting him and ganging up on him when he fell down. It was very clear that I needed to so something quickly or the lamb would be hurt. That left me choosing between two no-win situations: 1) put the lamb back with the other rams and start all over tomorrow morning in the dark and snow and cold to separate him out again; 2) put the lamb in an area where the ewes can’t attack him. I opted for choice #2. He isn’t happy, but he’s safe. He’s under the same roof as the ewes so at least he can feel the flock’s presence (a sheep always needs to have other sheep nearby or they become very stressed). Why is this important? No matter how long one is around animals, they surprise you. And they teach you, if you’ll pay attention and let them. 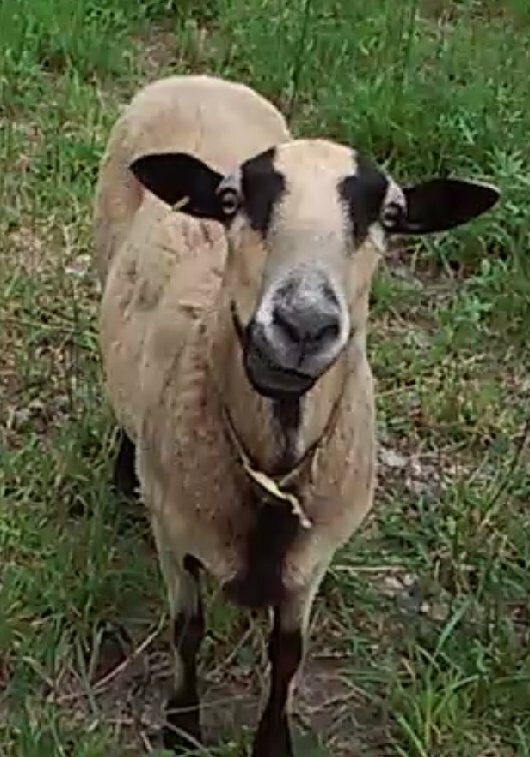 I’m so surprised at the ewes’ behavior, especially this little ram’s mother. I had thought they would be glad to be back together given the trauma they both went through during weaning (see Weaning Day). The senior ewe in the flock was the leader of the attack, and that is less surprising because she still has two lambs nursing. Barbados Blackbelly ewes are ferocious mothers and will do battle to protect their lambs. I just didn’t realize they would do battle against a ram lamb recently one of their own. And Barbados Blackbelly ewes are good teachers. I’ve learned this lesson well…and promise never to do it again. This entry was posted in Sheep on December 20, 2012 by eweforia. Barbados Blackbelly ram lambs, 12 weeks old. It is weaning day. That’s when they no longer get to nurse from their mother and, instead, are moved into a separate pen where the other rams live. Why is this important? Weaning day is a big day for everyone. Actually two days. None of us is very happy for those two days. The babies, obviously, want their moms and the comfort of milk-on-demand. So they yell their hearts out. The mom’s udders are full and uncomfortable and they’re listening to their babies in the other pen yell their hearts out, so they yell back. I’m trying to work and sleep amidst all this hollerin’ and bellowin’ and it isn’t easy, let me tell you. Then magically, on day three, no one cares any more. The ram lambs go on about the business of learning how to be boys and how to respect Alpha Ram while figuring out how to unseat him. The moms realize how much easier life is without having those kids constantly butting them in the bag and hangin’ onto a teat (with teeth!). And I’m just grateful that the noise has stopped. This entry was posted in Sheep on December 16, 2012 by eweforia.